Comcast Business announced that Hansen Properties – the home of Normandy Farm Hotel & Conference Center and Blue Bell Country Club – provides the latest technology amenities to its customers with Comcast Business Ethernet, phone and entertainment services. The high-performance network allows Hansen Properties to remain innovative from a technology perspective while offering superior customer service to guests. Hansen Properties is a private, family-owned company with two adjacent landmark destinations in Blue Bell, Pennsylvania – Normandy Farm Hotel & Conference Center and Blue Bell Country Club – which together comprise one of the largest hospitality centers in the region. These facilities are located on 210 acres with more than 220,000 square feet of indoor space and significant outdoor amenities including an 18-hole Arnold Palmer Signature Golf Course. Although 288-years-old, Normandy Farm and Blue Bell Country Club are premier destinations with state-of-the-art facilities. Their renowned farm-to-table restaurant, historic hotel, conference center, event venues and championship golf course all require modern technology solutions for operations and customer-facing amenities. “We require a reliable network that can handle the demand for internet access from all of our guests without issue. Our transition to Comcast Business was smooth due to excellent team assistance and customer service which allowed us to move from 12 wireless access points to 58 points across the two locations to provide that quality experience our patrons expect,” said Stephen Ferraguti, director of IT, Hansen Properties. 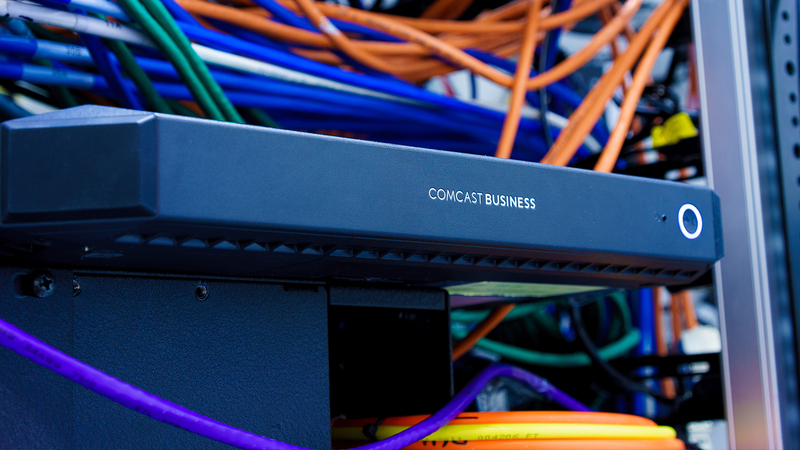 Comcast Business provides Normandy Farm with 1 Gigabit-per-second (Gbps) Ethernet Dedicated Internet (EDI) which brings high-performance access to power wireless access points and connect business critical cloud-based applications. Blue Bell Country Club installed 50 Megabits-per-second (Mbps) Business Class Internet service to assist in providing online access across the golf course. Additionally, both Normandy Farm and Blue Bell Country Club installed PRI Trunks as their phone solution to allow for the traditional copper-wired guest room phone service to interact with the latest internet-enabled communications options used by the operational team. Entertainment services in the bars, restaurant and individual hotel rooms are provided through the Comcast hospitality solution. Finally, an Ethernet Private Line (EPL) between Normandy Farm and Blue Bell Country Club allow for a secure phone connection and sharing of data among the 23 servers on the two sites that run point-of-sale, accounting and other operational applications.